With the release of her album Ctrl, SZA solidified her spot as one of the people’s favourite artists on TDE, perhaps behind only ScHoolboy Q and Kendrick Lamar. SZA has now announced a supporting tour for the project. 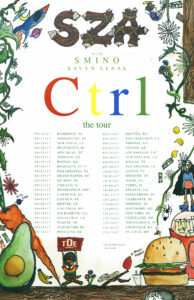 It will kick off in August and run all the way through until December.and Smino and Ravyn Lenae will join her. No European dates have been announced, for now. Check out the full schedule below.